And sometimes where you least expect it. 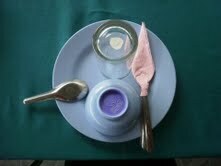 This is the place setting that greeted me at our first lunch in Thailand. The scene was an indoor-outdoor restaurant near the national park encompassing Thailand's tallest mountain. Most likely intended for bus loads of tourists, the restaurant was lined with tables, each one waiting expectantly for eaters. While the hike did not really "wow" me, this simple still life did. Reminiscent of an architect's conceptual diagram, this arrangement is the work of an experienced wait person. Composed of a plate, soup bowl, drinking glass, spoon and silverware set wrapped with a napkin, it is lovely balance of circles and lines. While the round elements focus the eye inward, the linear pieces guide the gaze outward. The plate unifies the whole but the smaller objects draw attention away from its static, center point. Folded in a diamond-shape, the napkin bedecked flatware and the soup spoon's oval cup add piquancy. Consisting of plastic, glass, metal and paper, the materials harmonize nicely. And the color scheme -- baby blue, silver and pink -- is very pleasing. I saw these dishes for sale on our expedition to Chiang Mai Plastic, a wholesale kitchen supplier beyond the beaten tourist track. I fleetingly considered their purchase. I was also drawn to those basket-like, food domes to keep the flies away. A set of six in cornflower blue could be just the thing! But I wondered whether plastic accouterments would look lighthearted and fun or tawdry and out of place back in Tokyo. What do you think?? ?